Reviews are in for "The Hobbit: Battle of the Five Armies"
"The Hobbit: The Battle of the Five Armies" ends Peter Jackson's second Middle-Earth trilogy with a booming finale. There are huge, CGI-laden battle sequences, though Bilbo Baggins may be absent from much of the film. So does the film justify Jackson's splitting up of the source material? Critics say for Tolkien fans looking for closure, this film will satisfy. Otherwise, it may be worth waiting until it's available to rent. "Even movie fans who don't care about J.R.R. Tolkien will have to admit that Peter Jackson's latest ventures into Hobbitdom deliver what they advertise...What Jackson's films don't include is anything new. After the "Lord of the Rings" trilogy and this prequel series, which began with "An Unexpected Journey" in 2012, we are in the midst of Hobbit fatigue. Still, for those wanting closure -- and a segue to the Oscar-winning 'Return of the King' from 2003 -- 'Armies' will ring true." The Daily News: Joe Neumaier. "'Five Armies' is a carefully controlled circus of freaks, marvels, grotesqueries, and high-flying pageantry. And like any circus, we're there to gasp and to laugh, but not to feel. The Hobbit movies have taken us there and back again, and I'm mostly just relieved the journey is now over." - The Wrap: Inkoo Kang. "The result is at once the trilogy's most engrossing episode, its most expeditious (at a comparatively lean 144 minutes) and also its darkest - both visually and in terms of the forces that stir in the hearts of men, dwarves and orcs alike. Only fans need apply, but judging from past precedent, there are more than enough of them to ensure that Battle walks off with the dragon's share of the upcoming holiday-season box office. "- Variety: Scott Foundas. "There's a little too much padding in the final Hobbit flick, and the best sequence is without doubt the film's first. But the central battle is indeed spectacular, and as The Age of Orc approaches, it rounds out this particular story in stirring and emotional fashion." - IGN: Chris Tilly. "The Hobbit: The Battle of the Five Armies' promises to be the New Zealand director's final excursion into Tolkien territory, and for that some praise is due, for staying the course if nothing else. While 'The Battle of the Five Armies' is unlikely to repeat the Oscar sweep that greeted the conclusion of Jackson's first Tolkien trilogy, in truth it is just as enjoyable as each of the five films that came before it. Jackson may or may not be resigned to the fact that, unless something very dramatic emerges, they will be his principal cinematic legacy - his pre-Rings eccentricity having been thoroughly eclipsed - but at least he can take a bit of time off. He's earned it." The Guardian: Andrew Pulver. "There was surely, of course, some financial motive behind turning The Hobbit into a three-year holiday-season investment. But now that the unexpected journey has come to a close, and Bilbo Baggins (Martin Freeman) has gone there and back again, it's easy to see where Jackson's head was at: He's after a kind of shadow remake of his own beloved, Oscar-winning Lord Of The Rings series, down to the basic progression from a fellowship's odyssey to a lively, crosscutting middle chapter to the warring forces of a grand conclusion. Try as he might to re-spark the Middle-Earth magic, though, Jackson has produced something closer in spirit to the 'Star Wars' prequels." A.V. Club: AA Dowd. 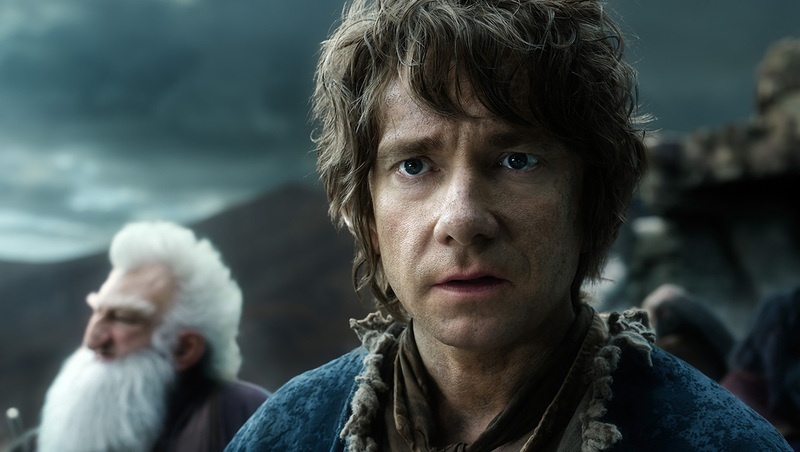 Tell us: Do you plan to see the new "Hobbit" film?